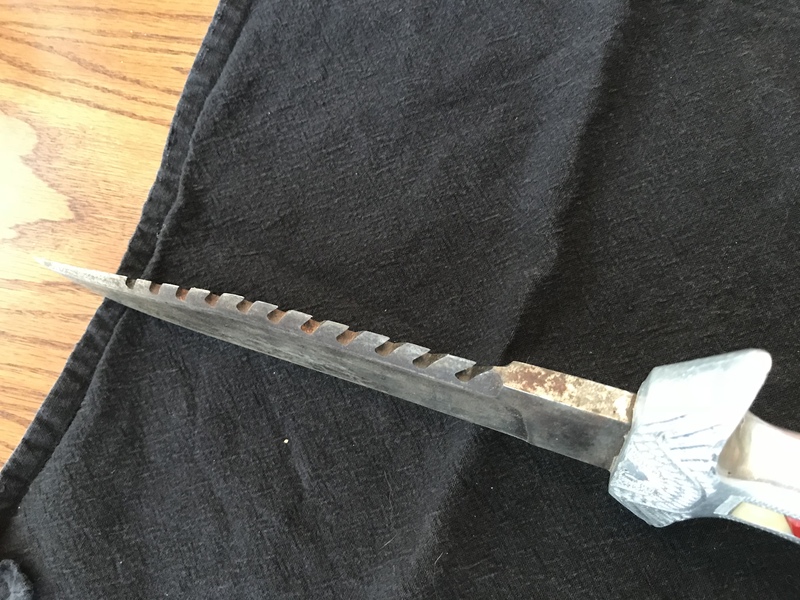 Is this knife worth anything? 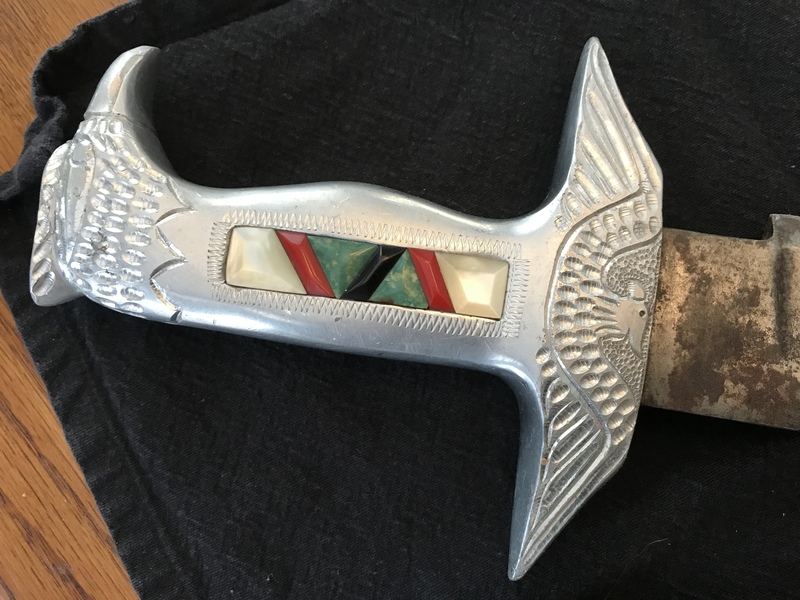 Thread: Is this knife worth anything? I don’t know much at all if anything about knives. A friend picked this one at a yard sale for $20, the stones look real but I don’t know. Any help on this? I told him I would try to find out something. It’s obviously hand made. 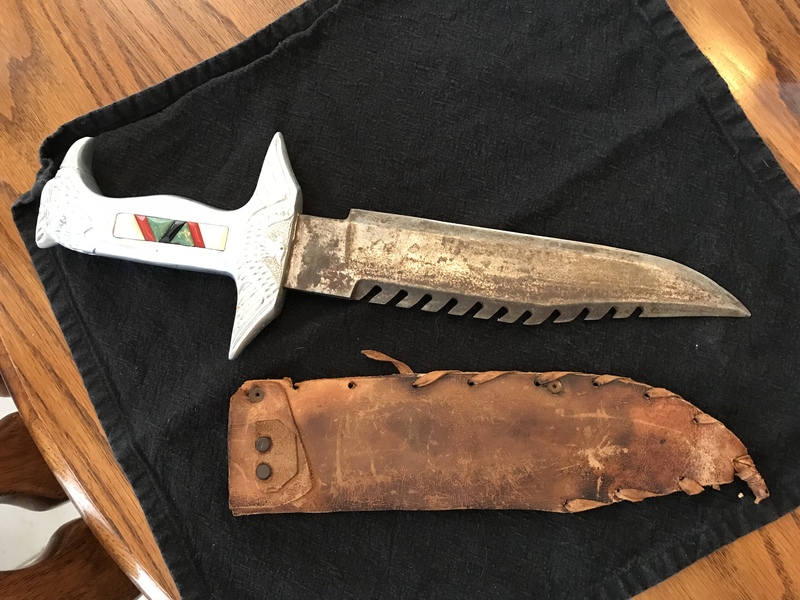 The only thing I see is the knife looks to be newer vintage than the sheath which does look pretty old. Perhaps a local gem stone club could assist with identifying the stones in the handle. The knife itself doesn't look near as old. Nice find and good luck! graydude, Gabill, MMinSC and 1 others like this. It's worth what was paid for it. Aluminum handle? Found on very low end knives. Teeth on the spine, reminds of the cheap fantasy knives produced in Pakistan after the movie "Rambo" came out. hogdaddy, goldshellback, Risasi and 7 others like this. Same guess here. Looks like a hajji-mart special designed for young Arab men. The old souqs of Doha and other cities carry a bunch of inexpensive blades for a variety of tastes. Falconry is still very active in that region, so handles have a lot of bird themes. 5lima30ret, Bad Bob, hogdaddy and 4 others like this. Not a knife expert, I hope its worth over $ 20. I think that the buyer made it worth $20 to him or her, and I he or she can unload it for $20. They can cut their loss. Just looks like a normal everyday surgical scalpel. Incidentally, those teeth on the spine look like knock offs of the AF survival knife, which have small saw like serrations designed to rip through aircraft sheet metal. But since they're not angled out like a true saw blade they're useless on wood, purely cosmetic, and make putting support hand pressure on the spine dangerous without gloves. airslot, AzQkr and hogdaddy like this. They are great garden tools if you can sharpen it. Good for digging worms in a pinch or for any chore you wouldn't want to subject a nice knife to. hogdaddy and AzQkr like this. Turquoise, red Coral...shell Pearl. All commonly used Native American materials. Hand engraving on the cast Aluminum handle/guard. Rotary burr tool cutting and hand wriggle type work done with a graver. It could be Native American? Reservation made? It could date back to possibly the 40s ???? based on the condition of the sheath. Casting Aluminum onto the tang of a premanufactured knife blade. Yes, it could be worth much more than $20. Never seen an American Indian knife made with saw teeth. I see a LOT of native american/reservation made out here from Utah, NM and Az. Never seen cast aluminum handle on an american indian knife either, usually bone/antler of some kind. airslot, msgt/ret, Bad Bob and 2 others like this. I Will let him know, he got a whole bunch of neat antiques- the Scottish Rights Bible is amazing!